Just Australian Buses 7 by Greg Travers comprises two discs. 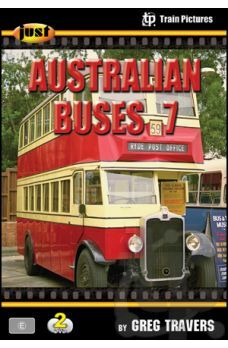 The first is a guide to the Sydney Bus Museum at Leichhardt (sydneybusmuseum.info). The collection is one of the largest in Australia, spanning the era from 1924 to the early 1990s. This “working” museum includes both former government and privately operated buses, including marques such as Ruggles, White, AEC, Leyland, Albion, Daimler, Dennis, Bedford, Atkinson, Ford, Reo, Volvo, Mercedes-Benz, MAN and Hino. While the collection is focused on NSW vehicles, included are exhibits from Melbourne, Adelaide, Canberra, Hong Kong and London. There is rare footage of exhibits, not often seen on the road, also includes a history of Sydney Transport Through the Decades. Disc Two comprises two themes. Firstly, coaches in the snow and secondly, coaches and buses in Queensland. Famous names such as Ansett-Pioneer, Greyhound, McCafferty’s, Deluxe, Coachtrans and Murrays are included. Before the Ski-Tube railway, most ski-tour operators operated beyond the snow line to NSW resorts, often into treacherous blizzard conditions. We film under these conditions, seeing Ansett-Pioneer and vehicles from many other smaller coach operators. We take a ride in a preserved Flxible Clipper. Another busy location for coaches was the Queenlsand Gold Coast. We make several THEN & NOW visits during 1987-2016. We move on to regional locations, at Toowomba; then buses and coaches amongst the street running sugar cane trains at Nambour; Rockhampton and lastly Cairns in 1989 and 1996. Of interest in these cities, is the large number of second-hand government buses seen in service from Sydney, Canberra, Melbourne, Adelaide, Brisbane and even Sheffield in England. There is NARRATION on this program. Cine film, analogue, Hi-8, digital, high definition video footage and still photography are combined, along with dubbed audio where the original sound was not available. 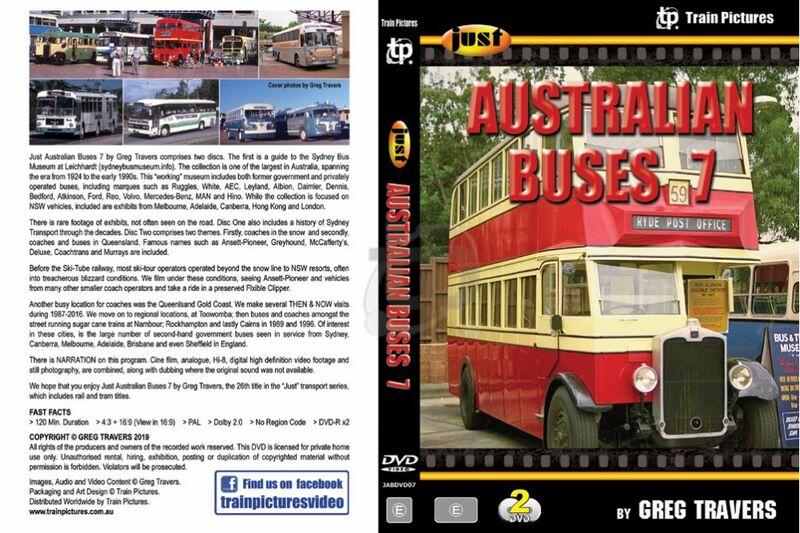 We hope that you enjoy Just Australian Buses 7 by Greg Travers, the 26th title in the “Just” transport series, which includes rail and tram titles.